1790s Yorkshire, England - Katherine Gilbert sets out for Wainforth Manor in North Yorkshire to fulfill her father’s last request. The master of Wainforth, Thomas Norcliffe, does not welcome her unannounced arrival, so Katherine must tread carefully around his dark moods while attempting to unlock the history buried in his ancestral home. After she receives more than one whispered warning from the townspeople in Wainforth Village, Katherine’s initial audacity begins to waver. Deadly secrets from the Norcliffe family’s past are resurfacing, and Katherine begins to realize that the biggest danger lies within herself—the wisest course is to leave, but she wants to stay at Wainforth Manor and uncover the truth about Thomas Norcliffe. Rattling down the road in a musty carriage toward a strange man’s home with the intention of introducing oneself and securing an invitation to stay awhile is a good moment to discard concern for societal approbation. So when I heard a female voice holler out from the hedges along the country thoroughfare, I did not hesitate to scramble hastily across the width of the carriage bench in order to trace the source of the noise. I had just stuck my head through the small window when I heard her again. I did not stop to think about whether she might have had ill intentions or been working on behalf of a gang of highwaymen. I pounded on the roof of the carriage interior to alert the driver, Mr. Brown. I had hired him that morning in Peterborough to take me to Wainforth Village, and his courtesy was buffed to a shine by a substantial fare. Mr. Brown brought the horses up sharply. I had unwisely failed to renegotiate my center of gravity prior to this deceleration and thus slid to my knees on the carriage floor. While giving thanks for the privacy of a hired hack, I clambered back to the bench and untangled my skirts. Mr. Brown was responding to the woman’s hail. “Yes, sister? What’s this fuss?” he called back as the vehicle jerked to a halt. I decided the situation was safe enough, and curious enough, for me to emerge, especially in my new independent incarnation. To my considerable surprise, our delay was created by a nun in a black-and-white habit who scurried toward us at a swaying trot. Before I could say a word, she resumed her shouting. She had already trotted past the carriage in the narrow space between it and the hedge, but then she suddenly halted and reversed course. She swung around to face me. Her skin was damp and hectic, her expression desperate. I hung half out of the carriage, clinging with my left hand to a strap just inside the door. The muscle in my upper arm began to quiver as the holy woman hissed at me. With that cryptic pronouncement, she turned and angled for a stile in the stone fence that bordered the road. I caught a glimpse of a sturdy black shoe and pale ankle as she clambered over the gate and off toward a copse of trees between the fields. It was true, I could no longer see her black habit. Maybe she went to pray at a secluded altar hidden in the trees, I told myself, not believing it for a moment. 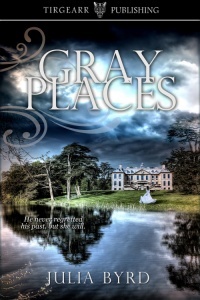 Gray Places is a winner!